There was Grandmother’s Day in Poland last Monday, and I wanted to bake something for my grandmother for that occasion. I had spent hours looking through cookbooks and cooking magazines to choose the best recipe. Finally, I opted for friands recipe. 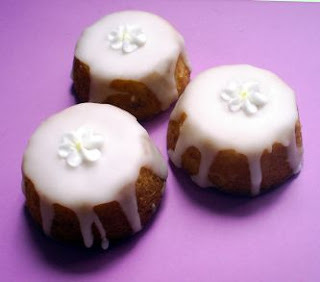 I decided to make these little almond cakes as the recipe resembled pear and almond cake I had baked a week before. The cake was absolutely delicious, so I thought that another recipe with almonds would be a perfect choice. Well, it wasn’t. Not that the cakes were not good, they were delicious, both I and my husband absolutely loved them. They were soft, they were spongy, they were moist and… they did taste almonds…but when my grandmother tried one, you could see from her face she didn’t share my love for these cakes. At first, I couldn't understand why, but then it reminded me that my grandmother did not like almonds. She had mentioned it to me a few weeks before Christmas when we talked about almond flavor in poppy seeds cake, but I totally forgot about that. So, if you do not like almond flavor either, forget about these cakes, you wouldn’t like them. But if you’re (like me) a fan of almonds, I suspect you’ll love them. They’re simple, but absolutely delicious, perfect with a cup of coffee in the morning or any other time of the day. The recipe was adapted from Donna Hay's Modern Classics Book 2. I altered the recipe slightly by adding vanilla sugar to the batter and reducing the amount of icing sugar. I also beat the egg whites slightly, even though the recipe didn’t ask for that. I didn’t have friands molds, so I baked my friands in muffin pans, I turned them upside down after baking as they looked nicer this way. I baked my friands plain, but you can top them with some fruit before baking. I suspect they would be delicious with raspberries, but feel free to use the fruit you like most. Also, if you don’t have almond meal, you can make your own by processing whole almonds until finely ground. Since my friands were meant to be a gift, I decorated them with icing and sugar flowers, but I think they would be better without the icing, served with a dash of whipped cream or vanilla ice cream. 2. Grease 12 friand molds or muffin pans. 3. Heat butter in a saucepan over low heat, whisking frequently, until golden brown. 4. Place the almond meal, icing sugar, vanilla sugar, flour, and baking powder in a bowl and stir to combine. 5. In a separate bowl, lightly beat egg whites with a fork, then fold them into dry ingredients. 6. Add the butter and stir to combine. 7. Spoon 2 tbsp of the mixture into each mold. 8. Bake for 15-20 minutes or until golden and springy to touch but moist in the centre. What a lovely gesture for your grandmother! I wish mine were still alive to spend some extra time with her.Great recipe and beautiful little morsels!